My apologies for not posting about yesterday’s events (I chose a nap during my best opportunity). Yesterday we worked to prepare for the upcoming camps and visitors. The Holocaust survivors are coming later than we originally thought, so we have some time to prepare for their arrival. We cleaned a cabin, made welcome cards for their beds and prepared craft supplies for the children’s camps that will happen later in the summer. 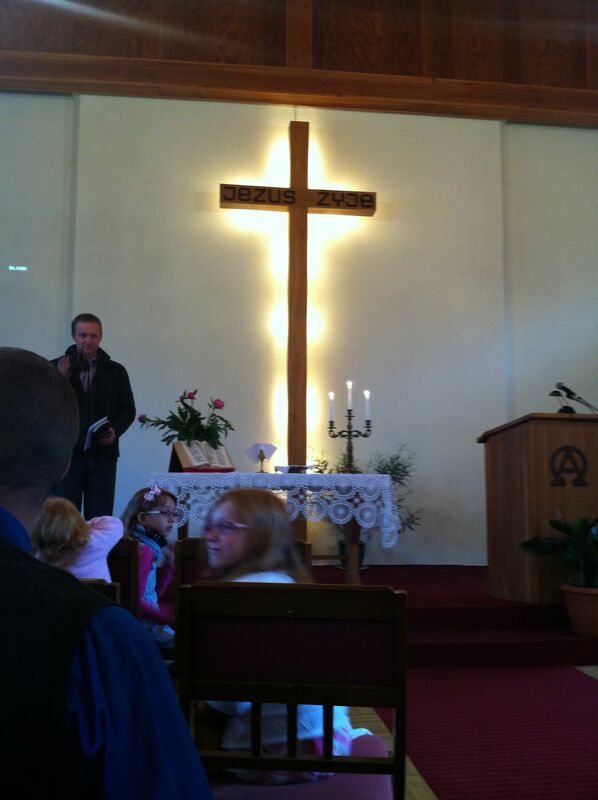 This morning, we attended the Christian church here in Ostróda. It was a great experience to be part of worship in another language and culture. There were many similarities (greeting time, songs, communion) but also some differences. Although I couldn’t read the lyrics on the screen or understand the song leaders, I recognized several of the worship songs. It was great to sing along in English as they sang in Polish and know that we are all pouring out love and praise to the same God. I loved how between songs people just prayed as they were lead – sometimes more than one at a time. They took the time to welcome us and to share with one another, with little concern for the clock. Although it had the potential to be uncomfortable, it was warm and welcoming and I felt at home. Later today we will tour the grounds. We haven’t done that yet due to cold and rain – this morning it was 41 °F with a windchill of 37! No one had the right clothes for that weather and there is no heat in the buildings, so we’ve been quiet chilly! Big change from the near-90 temps we left in Indiana! 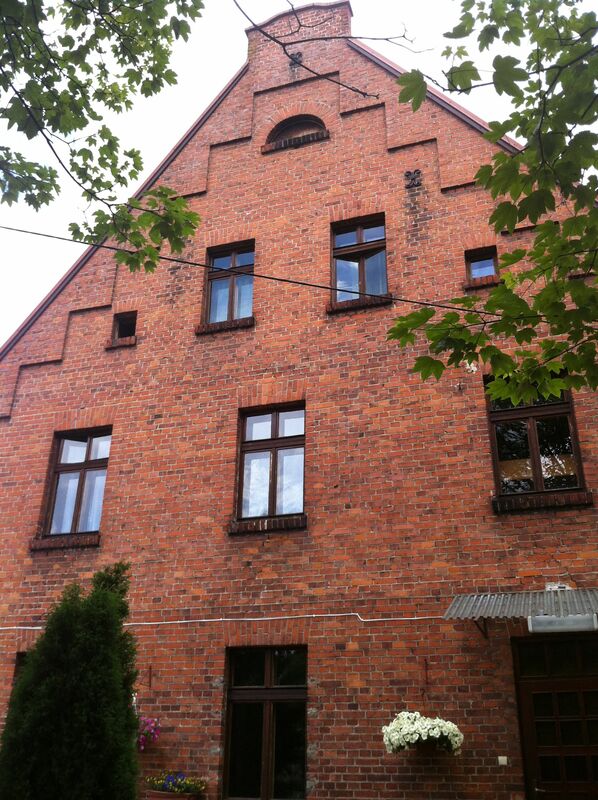 Tomorrow Ben will work to help prepare the camp for the arrival of the Holocaust survivors on Tuesday, while I go with three college interns to the local elementary school. This evening Ben and I have the opportunity to share our testimony during the devotion time. Please be in prayer for this. Sometimes it is hard for me to see how my story could have any sort of impact on others, but I know that I have been changed by the testimonies of some ordinary people. Pray that God will give us the words to glorify him through the sharing of how He has worked in our lives. I know that the few select photos I’m sharing here aren’t enough for some of you. If you want to see more you can watch my Facebook album develop here: Poland in Pictures. You are in my prayers. I love the pictures you have posted and I will be following along. 🙂 Stay warm! Love you! That gave me the chills reading that you were singing some of the same songs….singing in Polish & English…..what an awesome sound to God that must have been!!! You know, I would be quite comfortable in that temperature 🙂 Rachel, your testimony has already touched many lives, I know you and Ben will reach people with your powerful testimonies and passion for God. Still praying!! !